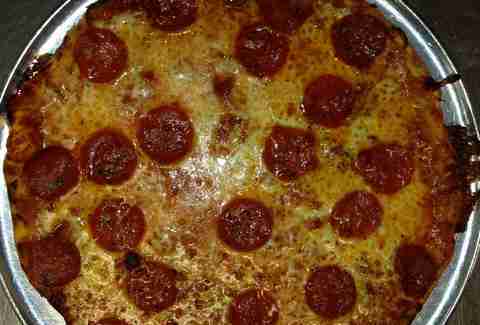 You already knew that Detroit-style deep dish destroys all other types of deep dish. 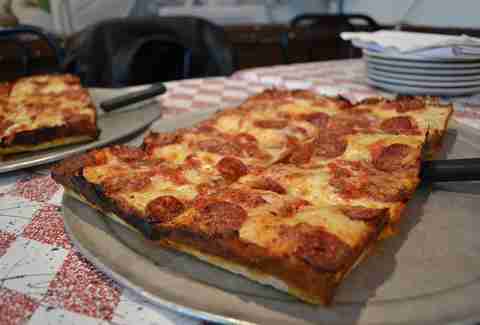 But there's much more to Michigan pizza than those square-cut masterpieces, and here's a comprehensive rundown of the best of the best, from all the way to the Northern reaches of the UP to... yes, of course Detroit's still heavily involved. Under the direction of three-time James Beard Award nominee/very Italian-named Luciano del Signore, Bigalora Cucina makes all-natural Neapolitan-style pizzas using clean, sustainable products from ecologically mindful producers. The name "Bigalora" is derived from "biga," the all-natural pre-fermented style of leavening used in Italian baking. The dough contains no commercial yeasts or added sugar. You could even make the case for this being a "healthy" pizza, and not be wrong! (Which will definitely help justify you annihilating a whole pizza all by yourself, because all pizzas are personal pizzas if you believe in yourself and try hard enough.) Produce is sourced from local producers and roasted in their custom-built wood-fired ovens (even in the truck). Select charcuterie and sausage is made in-house, as are pastas and desserts. In both style and substance, Bigalora is about as Italian as pizza can get outside of actual Italy. Look, it's Buddy's. It's the most famous pizzeria in Michigan. It's where "Detroit-style deep dish" was born. 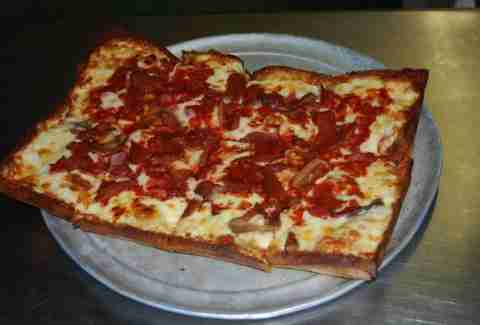 It is one of the cornerstones of Detroit cuisine. It is a classic and an icon. 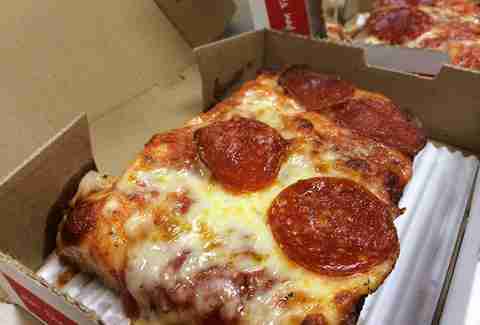 There might be pizzas you like more, but theirs is the OG of Detroit pizza. Plus, hanging out at 7 Mile and Conant gives you mad street cred. It's a gross understatement to say that when Dave Mancini opened Supino Pizzeria in Eastern Market in 2008, he was taking a big risk. This was in the very, VERY early days of Detroit 2.0, back when there was just Slows and Russell St. Deli and a few people insisting that Detroit "really isn't so bad." Fast-forward to 2015 and Supino has been featured in GQ and on the Food Network, named by various distinguished outlets (and celebrities!) one of the best pizzerias in the county. Now Mancini is about to open La Rondinella next door (OPEN OPEN OPEN OPEN), a 40-seat dining room with a full bar, homemade pasta dishes, and grass-fed beef -- as well as the pizzas offered at Supino. For proof of Supino living up to its hype, order The Affumicata, aka The Smoky -- made with speck, roasted garlic, smoked Gouda, ricotta, and mozzarella -- and approach the divine. 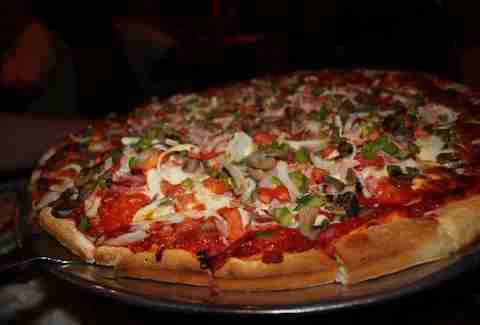 The overwhelming majority of Metro Detroit chefs agree, Loui's is the best when it comes to Detroit-style deep dish. Yes, better than even Buddy's. Hit the racetrack, then head to Loui's and agree amongst your friends that Hazel Park is pretty cool, for a suburb. Named one of the top 25 pizzas in the country by Alan Richman for GQ in 2009, Tomatoes is Neapolitan pizza by way of New Haven, where owner Mike Weinstein learned the art of pizza-making under the tutelage of the top dogs in Connecticut's pizza circuit, which is a distinct American pizza region all its own. Coal-fired ovens spit out thin pizzas with crunchy-chewy crusts that look charred on the bottom (they're supposed to). 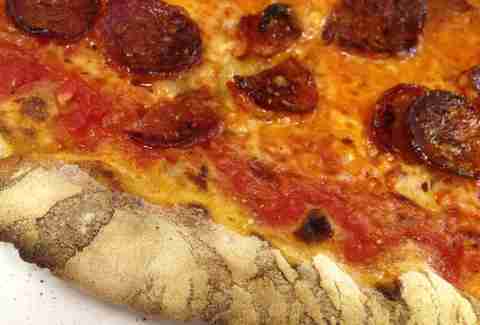 Order the New Haven classic "Red," which has no mozzarella, or go with the more Midwestern-friendly "Classic" with pepperoni. And do not skip the garlic bread. This Downtown brewpub serves chewy granite-baked pizzas made from a 100-year-old sourdough starter, topped with fresh, locally-sourced ingredients. For the freshest and most locally sourced pizza possible, order the "Market," made with whatever they found at the farmers market that day, and goat cheese from Ann Arbor's White Lotus Farms. As an added bonus, you get to drink ALL OF THE JOLLY PUMPKIN BEERS on tap. 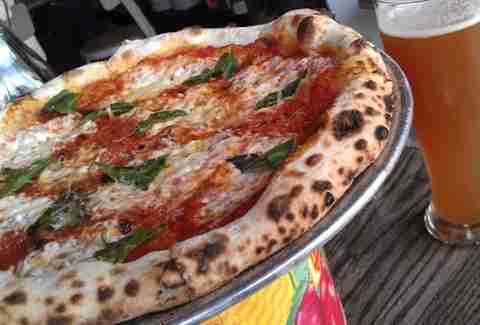 Mario Batali loves it and Food & Wine called it one of the best pizza places in the United States in 2012. If that's not enough ringing endorsement, just know that in a college town FULL of pizza, this one keeps coming out on top. Mani Osteria serves wood-fired Neapolitan-style pizzas with unique toppings like black truffles and balsamic onions, but the Puttanesca – made with garlic cream, Calabrian chile, oven-roasted tomatoes, olives, oregano, and Grana Padano – might be the most decadent vegetarian pizza you'll ever eat. One of the best things about pizza in Southeastern Michigan is that so many places with roots in non-Italian ethnic cuisines are opening up. We see a lot of this in Hamtramck, with chicken tikka pizza available aplenty (Amar Pizza is a local favorite, known for its evil ghost pepper pizza), but Curry on Crust in Canton is on the next level. Chicken is the protein of choice (there is no pepperoni, no ham, no beef) and topping choices include gobi (cauliflower), aaloo (potatoes), mango, sweet corn, chopped ginger, paneer (a fresh cheese popular in Indian cuisine), and various curries. Try the Chilli Paneer Pizza (if you can handle it) with an order of veggie puffs (their version of samosas). With more than 50 years in business, DeLuca's – opened by Italian immigrants in 1960 – is a Lansing institution that serves pizza from family recipes that date back three generations. Get the House Special with pepperoni, ham, mushrooms, green peppers, onions, and tomatoes – which is, after all, what its famous for – or try one of its more inventive creations, like the potato pizza or the spinach pizza. You've probably been in a position where you needed pizza late at night, yes? Well, if you're in East Lansing or Grand Rapids (or Chicago! 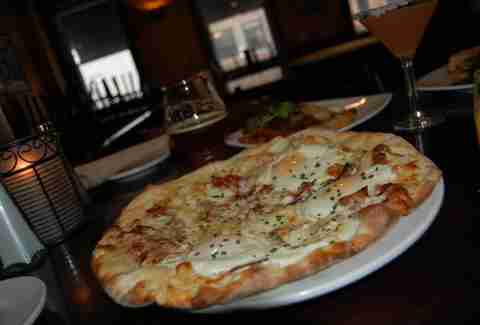 ), Georgio's is there for you, serving up huge slices of "gourmet" pizzas – a dubious claim, since the dozens of rotating varieties include "Mac and Cheese" and "Ranch BBQ Chicken and Bacon" – until 3am. B&C Pizza might just be mid-Michigan's best-kept secret. It calls itself "Chicago-style," but that is really a disservice to the round, toothsome pizza... in that it is not a dry and terrible piecrust filled with marinara sauce. Bay City-native and Detroit-area food-and-whatnot writer John Horn notes, "They call it Chicago-style but it’s really a glorious, thick draping of mozzarella over toppings." Luigi's is a family-owned and old-world Italian joint that has been around since 1955. 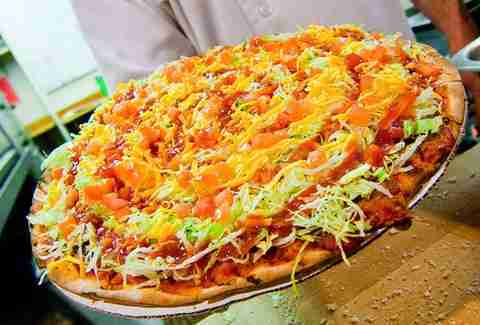 They serve thin-crust pizzas made from their own dough recipe, unchanged since 1955, that is made fresh daily. Pizzas are baked in a brick oven and served with a bottle of red wine vinegar (meant to be poured onto the pizza), which is a Flint tradition that the rest of the state needs to adopt immediately. 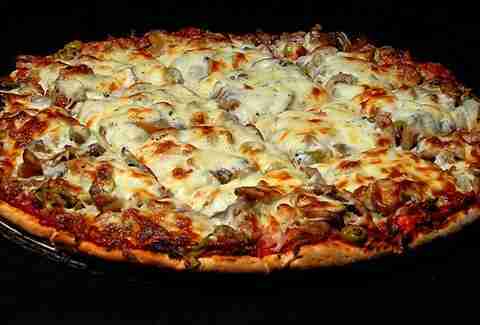 The 4 Star Deluxe comes gloriously piled with all the meats, plus mushrooms, onions, olives, and green pepper. One ingredient not listed at Maestro's Pizza is TLC, which every pizza is obviously made with. Hand-tossed dough is made fresh daily with their signature sauce at this no-frills pizzeria and bar. 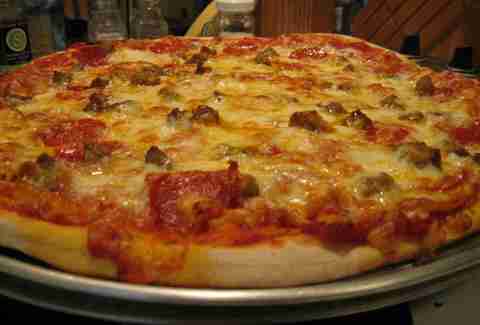 Get the meat pizza with pepperoni, ham, house-made sausage, and fresh ground beef. 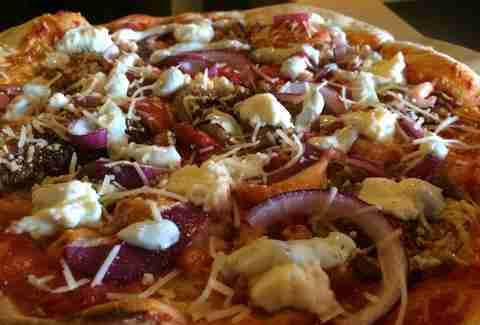 Cult Pizza is aptly-named, considering the cult-following it has built (and hey, it's cheaper than Scientology!). 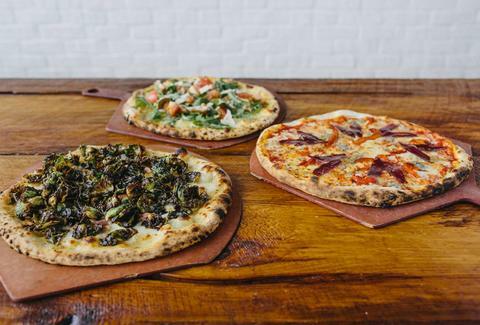 They specialize in East Coast-style pizza – very big, very thin slices – and are a "farm-to-crust" pizza joint, sourcing all veggies, meats, and cheeses from local West Michigan farmers and producers. 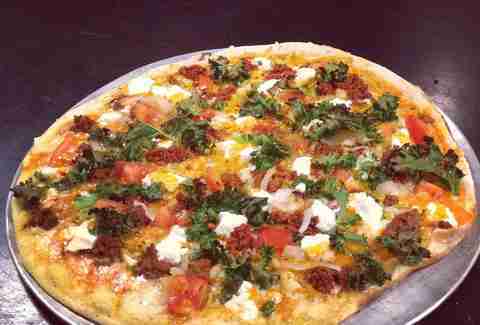 Pizzas come in combinations like black beans; Grassfields cheddar; chorizo sausage; and fried egg topped with greens, dressed in a spicy Italian dressing. Out of necessity, the menu is seasonal, so don't go running to Yelp every time your favorite pizza is off the menu. It's always nice when a great brewery also makes great pizza. It just makes the world feel right and good and sane. Since they started serving up their rustic wood-fired pizzas alongside their small-batch brews, Harmony Brewing has made a name for itself as one of Michigan's best pizza places. 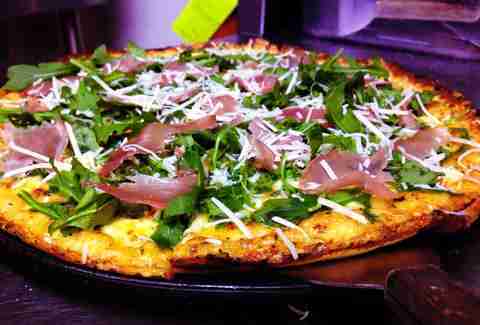 They have several vegetarian-friendly options, like the Good Earth and the Greek, but the Handsome Ben is a delicate little minimalist wonder: goat cheese and prosciutto, no red sauce, topped with local Vertical Paradise Farms arugula tossed in lemon-infused olive oil and cracked black pepper. What you're getting: Pepperoni, Italian sausage, mushrooms, green peppers, and anchovies – AKA "everything"
Fricano's is the kind of place that knows what it's good at and sticks with it. They ONLY serve pizza (and it's cash only), and they have only a small selection of toppings. All pizzas are on 12-inch, cracker-thin, crunchy crusts (the only size available) and topped with a top-secret cheese (don't bother asking). 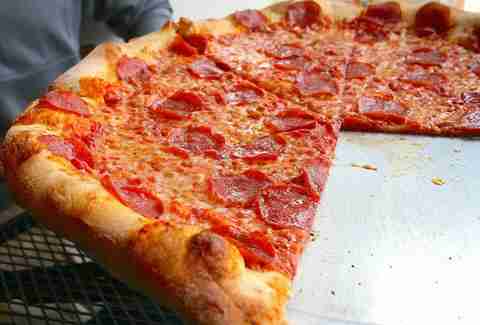 Yet, despite all those seeming restrictions, Fricano's is consistently ranked among the best pizzerias in the state. Once you try it, you won't question why. Salt of the Earth is one of West Michigan's true dining destinations (and there's not a whole lot else in Fennville, save for Virtue Cider, which you absolutely must visit when in the area). Located in the heart of West Michigan's agricultural belt, Salt of the Earth is hyper-local and hyper-seasonal, working with farms and growers within a 50-mile radius for fresh produce, dairy, and meats. Also a bakery, Salt of the Earth makes their own wood-fired pizzas, which you should absolutely order along with everything else you should absolutely order... which is the whole menu. Bring a group. And try the Whole Hog pizza, made with fresh garlic sausage, house-made bacon, sopressata, and red sauce. 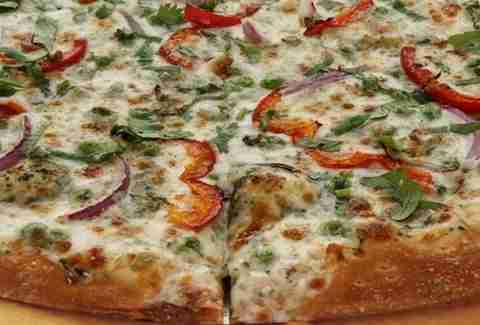 Located in the Southwestern Michigan "beach town" of St. Joseph, Silver Beach Pizza serves thin-crust pizzas that range from the extra-rich and extra-meaty to the lighter, veg-friendly UJ's Sunburst: a highlight of local produce that includes fresh asparagus, yellow & green squash, mixed sweet peppers, cherry tomatoes, fresh mushrooms, and fresh cilantro. You can definitely get pizza with frills in Northern Michigan, just not at Richie's. Richie's serves subs, salads, sandwiches, and pizza in a down-home deli with just a few tables. Order the meatball pizza, because this is a deli and it is an option, and one should always order the meatball pizza when one is presented with such an option. The Ambassador is a yooper institution. EVERYONE knows the Ambassador and it is a must for all "trolls" to put on their UP bucket lists. Order the lobster pizza with lobster, white Colby cheese, tomatoes, parsley, and garlic olive oil, served with lemon wedges. You'll want a good base coat when you dive into one of their famed "fish bowl" drinks, like the Scorpion, which is 25oz of pineapple and orange juice, gin, rum, and crème de almond -- which is always both a wonderful and terrible idea.